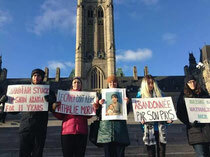 The Support Committee for Nathalie Morin created this site to come to the assistance of Nathalie and her children, Samir, Abdullah, Sarah and Fowaz, who are being held against their will in Saudi Arabia by a Saudi national, Saeed Al Sharahni, Nathalie’s common law husband, since March 2005. Nathalie is a victim of domestic violence and her children also suffer from this violence. On this site, you will find information on Nathalie’s story, her daily life, as well as the actions of the Committee aimed at bringing her back to Canada with her children. A film recorded by Nathalie’s mother and brother in the summer of 2009 shows her daily life in Saudi Arabia. This site shows you what action you can take, as a citizen, to help Nathalie and her children to come back to live among us. Your support is precious and we are counting on you to help us in our actions. The Support Committee for Nathalie Morin. Open letter to PM_2019-01-13 Finale2_EN. On this day, November 30th, 2005, Lord, I ask pardon for all that I have done, for all my mistakes, for not having listened to you... Lord, I ask for grace and for your blessing. Confer on me a place in heaven. I wish to repent before you, Lord. Lord, bless my mother with all your might, confer the benediction. Lord, make it so that one day, I may go back to Canada, with my children, for the good of my children. Johanne Durocher, Nathalie's mother, gives news about her daughter in the media. We hope she will be back soon un Quebec with her children. On June, 10th, 2011, Johanne Durocher, Nathalie's mother, and Dominique Morin, her brother, were received by Prime Minister Jean Charest at the Assemblée nationale of Quebec. After a question from the MP Amir Khadir on June 9th, the Prime Minister pledged to introduce a motion to pressure the Canadian government to act and help Nathalie. According to him, «C'est une affaire qui, à mes yeux à moi, est extrêmement, extrêmement préoccupante». 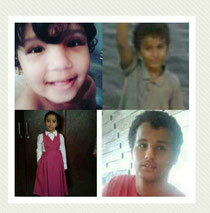 Who is the Al Sharahni family?